Here is a free 5S Overview module. 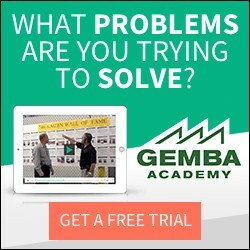 It’s actually the first module of our 5S Workplace Productivity course that is part of the Gemba Academy School of Lean. For more free online modules like this, including free quizzes and PDF downloads please visit our site. Simply click the arrow in the middle of the screen to start the module. And if you’re reading this article via your RSS email subscription or your RSS reader you may need to visit LSS Academy to view the module. Oh, and be sure to click the little icon in the lower right hand corner of the player in order to watch the module in full screen mode if you so desire. Enjoy! 5S is a very good tool but in occident sometimes people interpret as aesthetics, I were working 10 years as General Director of Lerma Plant of Mitotoyo in México, I undertood that you need apply 5S firstable to your brain, as an example you should sort first your ideas inside your brain before you do externally with plain things. Con razon nunca pudiste hacerlo aun con ese tiempo y posicion. Occident, no inventes mejor di occidenteishon para el caso es lo mismo. Que lastima no saber siquiera los puntos cardinales.